Home » Service Manual Catalog » EPSON Adjustment Programs » InkJet printers » AP_XP235 I have paid for Reset Key but not received yet. Epson XP-235, XP-235A, XP-332, XP-332A, XP-335, XP-432, XP-445 (EURO) Ver.1.0.2 Service Adjustment Program New! 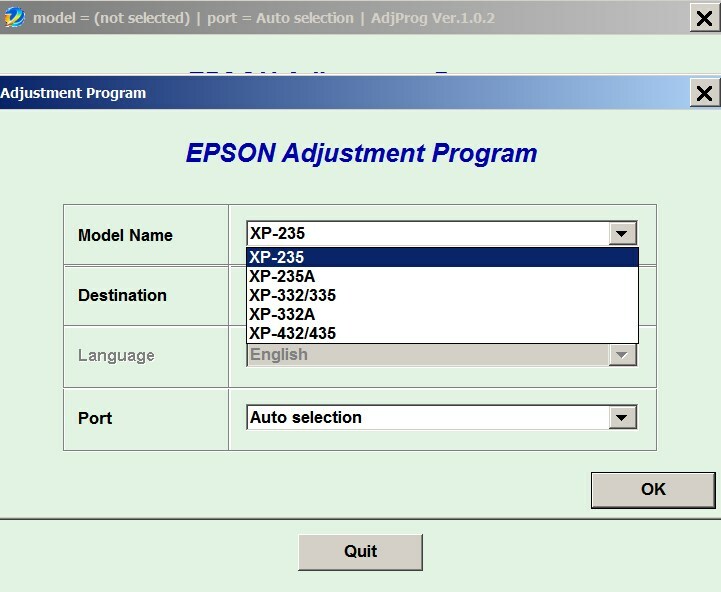 The Epson Adjustment Program for New models Epson XP-235, XP-235A, XP-332, XP-332A, XP-335, XP-432, XP-445 can be used under Windows only (Millenium, 2000, XP, Vista, 7, 8, 10 [in compatibility mode]). We recommend reading the Epson XP-235, XP-235A, XP-332, XP-332A, XP-335, XP-432, XP-445 Service Manual before using the adjustment utility. My i250 fell apart while cleaning, and I needed a drawing on how to put it back together again. I purchased one of your keys and ran the software on the Epson Artisan 1430. It worked great, I now have a working printer. You spared me the expense of having to replace my printer. I can\\\'t thank you enough for your service. I have several other printers that at some point will be in need of your software as well. When the time comes I will call on your services again. Thank you so much! Just wanted to commend you on the high quality service. Thanks. I\'ve bookmarked your website for future reference. Notify me of updates to Epson XP-235, XP-235A, XP-332, XP-332A, XP-335, XP-432, XP-445 (EURO) Ver.1.0.2 Service Adjustment Program New!